On this very low-key, drink-wine-in-your-sweatpants-on-the-couch, NYE we discovered that C has a very useful skill. 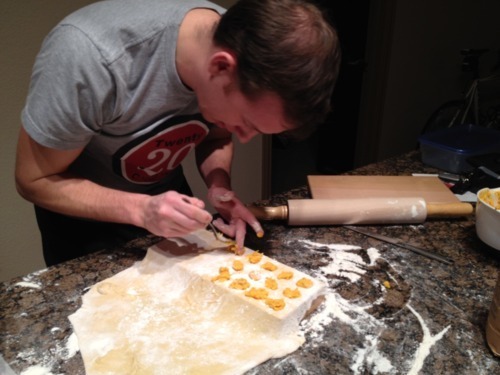 He is a PRO at making homemade ravioli. It might have something to do with the OCD and his need for perfection but never the less, he perfected ravioli making on his first try! 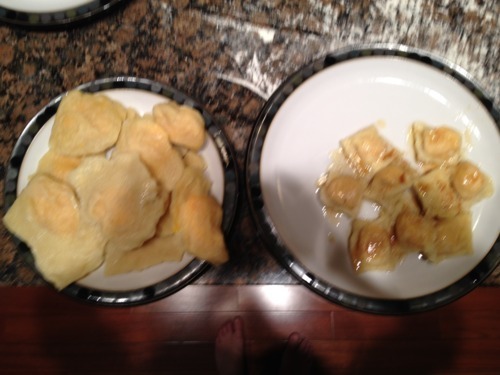 Those huge, ugly pancakes were my attempt at homemade ravioli. I was being stubborn and rebelling against the “ravioli maker”…(can you even call two pieces of wood a ‘ravioli maker’…???) C’s raviolis were perfect little pillows of delicious heaven all covered in a warm blanket of Sage Brown Butter Sauce. HEAVEN! Thank goodness C came through in the end, otherwise we would have starved our way into 2012. Preheat oven to 425°. On a foil-lined baking sheet, roast butternut squash until tender. Let cool, peel, then mash with olive oil, maple syrup, nutmeg, mascarpone cheese & salt. In an electric mixer fitted with a dough hook, add eggs, 1 at a time, and mix. (We did it by hand because we cooked at C’s house and he didn’t get a sweet, orange stand mixer for Christmas like someone else I know…. )Continue mixing and add all the flour and water; continue mixing until it forms a ball. Sprinkle some flour on work surface, and knead the dough until elastic and smooth. Wrap the dough inplastic wrap and let it rest for about 30 minutes to allow the gluten to relax. 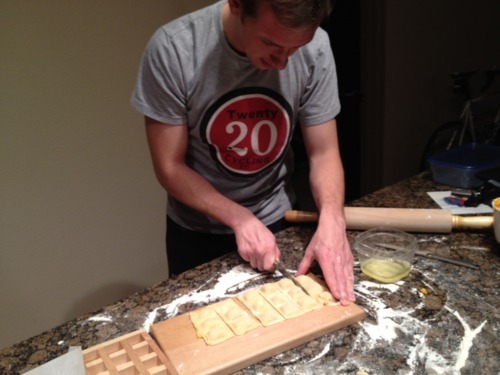 Dust the counter and dough with flour, and lay out the long sheet of pasta. Brush the top surface of dough with egg wash. Drop 1 tablespoon of cooled filling about 2 inches apart on half the sheet of pasta. Fold the unfilled half over the filling. Gently press out air pockets around each mound of filling and form a seal. Cut each pillow into squares. Cook the ravioli in plenty of boiling water for 3-4 minutes. Ravioli will float to the top when cooked so be careful not to overcrowd the pot. 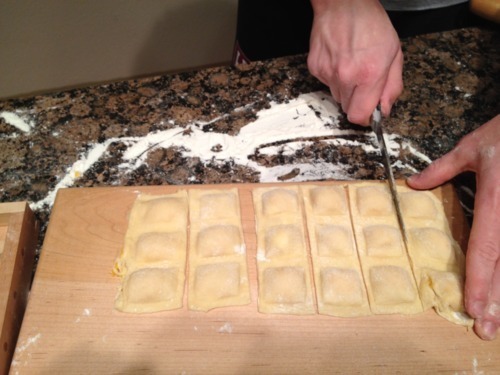 Lift the ravioli from water with a large strainer or slotted spoon. Plate the pasta and top with sage brown butter sauce. In a small pan, melt the stick of butter. Add the sage and continue to cook until the butter starts to brown. Remove from the heat.